Heat behind rise in mystery fever? HEALTH officials in Bihar blame extreme heat for the increase in the number of mystery fever cases in the state. The disease has so far killed 169 people and affected 286 others in the state. Last year it had killed 50 and affected another 150. The state government has classified the disease as Acute Encephalitis Syndrome or AES, though it is yet to identify the pathogen. “In the previous years the AES outbreak happened in June. But this year, the cases were reported as early as May 27 because summer arrived early,” says Gyan Bhushan, civil surgeon in Muzaffarpur. The district has reported the maximum number of AES cases. The other affected districts are West Champaran, East Champaran, Samastipur, Vaishali, Shivhar, Gaya and Sitamarhi. Data by India Meteorological Department in Pune corroborates the claim made by health officials in Bihar. It shows that from 2004 to 2008, there was a gradual rise in weekly summer temperature in the state. 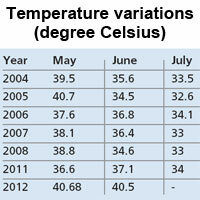 Summer temperature has risen considerably since last year. This year the mercury touched 44°C. It crossed 40°C in the middle of May itself. Data from earlier years shows that temperature above 40°C was a rarity in the area. The health officials say the number of AES cases fell suddenly after the monsoon showers that brought down the temperature. Rains started in Muzaffarpur on June 17. Instead of the 30-32 cases that were registered everyday before rains, only one or two cases are registered now, says A P Singh, civil surgeon, Muzaffarpur. However, officials at Sri Krishna Medical College and Hospital in Muzaffarpur do not think AES has anything to do with the rising temperature. They believe an unknown virus is behind the spread of the disease. “Heat is not the prime reason. Mental imbalance and body stiffness cannot be caused by heat stroke,” says Braj Mohan, head of pediatrics department at the medical college. In June, the National Institute of Virology (NIV) in Pune collected cerebrospinal fluid samples of patients in Bihar to ascertain the cause. It is yet to arrive at a conclusion. The state government also plans to send samples to the Centres for Disease Control and Prevention. The government is generating awareness regarding AES with the help of anganwadi workers and accredited social health activists. They are advising people to drink enough water and maintain proper sanitation. “We have created teams to survey the affected areas and do malathion fogging to kill mosquitoes,” says Sanjay Kumar, the state health secretary.